Next came Ecaudor, the country which literally has everything! We started on the beach in a place called Montanita. Sunset beach! The beach here is beautiful, and we saw some AMAZING sunsets from it. The sea was beautifully warm and this was another place where you didnt have to moce from your sarong all day as everything you could possibly have wanted was brought around by vendors. The people. We spent a fab evening with Kate and Rachel, who we had met previsouly in Chile and Peru here on Cocktail Street! The stalls pop up in the early evening and serve super cheap fresh fruit cocktails all night! We also met 'Elijabeth' here, who Gareth had an especially good time on the beach with, going for a run along the sand. Gareth's run, a token gesture to an attempt to keep fit, turned out to eb a little more than he bargained for when he found out that Elijabeth is actually an incredibly talented long distance runner with very impressive marathon times. He did finish and keep up though! The Fire breather who entertained in the streets outside the restaurants in the evenings was doing his usual thing when he accidentally set fire to his bottle of lighter fluid on the floor. VERY impressive explosion, VERY quick end to the show! From Montanita we moved on to Banos, or in English, toilet. I'm not sure why it was named that, its a really niced place! Being in Ecuador, everything is cheap here, and Banos is a hub for adventure sports so we really took advantage of both of those things and got our adrenaline fix whilst we could. We did a bridge swing (might be lying if I said it was the biggest one ever but it was good fun! ); went paragliding near tunguruhua (a volcano); and went white water rafting. All of which were incredible in their own right, my favourite was probably hangliding but only because I hadn't ever done it before! The Thermal Baths. In the valley they have a natural thermal baths, with freezing cold plunge pools for added enjoyment... We spent the evening there with some friends of ours getting lobster hot and FREEZING cold. Its such a nice place to relax and has great atmosphere as the locals use it as a place to meet and socialise in the evenings. The Ionic Detox! On recommendation from some Aussie travellers we met, I went for an Ionic Detox in one of Banos' many spas. It involves having your feet in some water for half an hour and them putting ions into the water! Its supposed to cleanse your body, and the water changes colour depending on what your body is being cleansed of! It could all very easily be rubbish but it was fun nevertheless. Incase you were wondering, I was stressed and had chronic fatigue.... either that or my feet were very dirty as the water came out a very dark brown! Buggy Rental! We rented a buggy for a day and took it out to a waterfall a bit further along the valley. It was really good fun to drive along the winding mountain roads, if a little humiliating in the middle of town, and the views were magnificent. The buggy moment. We had almost reached the waterfall when our buggy started to make VERY strange sounding noises- and then stopped going forwards completely! The company were very good and sent someone out to us straight away with a new one, but it was still embarrassing when he just got back into our broken buggy and drove off without a problem... It was broken, honest. Paragliding practice! Its hard to explain how silly you feel going through the motions of paragliding on an inside swing in their office. Running up and down and being held in the air with all manner of safety equipment just feels ridiculous, especially when your friend is on hand to take pictures of you! Clearly I didnt take my practice seriously enough, as on landing at the end of my flight, I was taken off guard and instead of runing forwards, I just fell over and pulled the instructor onto me in a field where lots of locals were farming... Not the best part of the flight, although they clearly enjoyed it and carried on reenacting it to me for a good while afterwards! Guineapig! In Peru nand Ecuador we had been told the locals ate lots of guineapig, but yet to see it we thuoght it was more of a touristy myth. But in Banos we walked past them being roasted on the barbeque, head and all, and selling like hot cakes. Gareth had one for lunch, I tried a bit but have had too many of them as pets to start eating them for lunch... Sorry marmite. From Banos we moved onto the Capital, Quito for a brief visit. The Equator! Just oustide of Quito is the middle of the world! We went to the museum withe the official monument etc, although apparently they have built it in the wrong place. Its two hundred metres away from the true equator as indiciated by GPS! The old museum is ok, not laot there but good to visit anyway, however the new museum on the actual equator is mch better, with experiments to do with the spin of water and magnets etc (Again, whether phony or not these were fun! ), and the favourite one being the egg challenge! Gareth and I both earned our 'Egg Master' Certificates by balancing an egg on the head of a nail. A huge bragging rite amongst the travellers in South America! The Volcano! We went on a tour to climb up to a glacier on Kotopaxi Volcano, at 5000 meters. We would have like to have climbed it to the top but we didnt have alot of time to acclimatise to the altitude and it was very expensive, so we settled for this instead! It was a great day, the glacier was indeed very high, and it was snowing on the day we walked it so it gave the trek a very dramatic element! Early one day we paid to go up the Teleferica (cable car) up the hill to look at the views of Quito. Onlywe were followed up by a cloud that hung around for the whoole time we were up there! We managed to see nothing but the path around us, and I fell over in the mud! Successful trip! The Volcano tour guide and bikes. In the list of traits required in a otur guide I would say that 'Enthusiasm for the activity involved' would be high on the list. Apparently not. After we had driven up to the car park of the volcano our tour lady said to us, 'The weather isnt that great, so I reckon we just go down now and get some tea'...Errr no! She was forced to walk up to the refugio by half of the group, and refused to go any further. It was also at this point she revealed to us her second key problem as a tour guide, she had actually never been up to the glacier before! So tagging onto another group, we walked up to the glacier, and came down to begin the mountain biking half of the day. Same story, as it was rainy it was suggested to us that we get the car halfway down and then bike the more gentle half! Again we persisted and finally conviced them to let us bike.... If only we had known! Our brakes (or 'go faster paddles' as I affectionately named them) were entirely useless to the point that I had mine on full the whole way down and still had to use my feet if I wanted to stop! Still an incredible day, USELESS tour company! On arriving at the middle of the world, we were asked if we would also like tickets to the 'etnico museum'. This is a museum about all the different tribes in Ecuador and their traditions etc. Somewhere though this was lost in translation for Gareth who said to me after, 'why would I want to go in there, I dont care about Rocks at all...' awkward. Our final destination in Ecuadir was Otavalo, a market town near the border. The market. Its HUGE and has everything you could ever want there from handicrafts to fake branded clothing. We spent hours there haggling for our holiday souvenirs and came out with our pockets alot lighter, and with some seriously questionable 'travellers attire'. The lake! 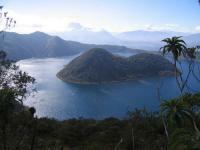 Just outside Otavalo is a beautiful lake where you can have boat rides, and its a volcanic lake so cool shape etc. I cant remember the name of it, and the tour was in Spanish, but it was pretty! When you come to write your blog and you want to tell people about something you did but you cant remember the name of it, what exactly it was, where exactly it is, or what you found out about it! The haggling! I hate haggling, and am rubbish at it! Gareth however would have it in his top two activites and so luckily could haggle for all my stuff for me! Some of the Ecuadorians just didnt understand the game, going up and down in price as if the game was just 'guess the right number' though, which makes things hard! Having prepared ourselves for the worlds most scary border crossing, we sailed through without so much as a hint of a customs office (traveller rumors get spread and exaggerated pretty fast! ), and arrived in Colombia safe and sound. Ecuador is a great country, and I feel like I hardly touched the surface but definitely had a great time there!